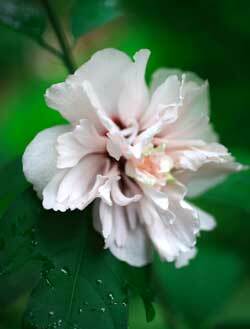 If you're looking for a large shrub that blooms its little heart out in late summer when few other shrubs would even think about blooming, one that thrives in full sun, may I introduce you to Hibiscus syriacus, aka Rose of Sharon or Shrub Althea. 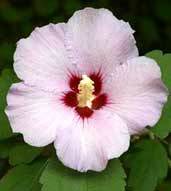 The Rose of Sharon is a deciduous, upright, occasionally spreading shrub or small tree with multiple trunks. The branches grow upright and will not droop except when in flower. The leaves emerge late in the spring. Leaves are medium to dark green in summer with no or poor yellow fall color. The bark is light brown and thin, and the wood itself is weak. 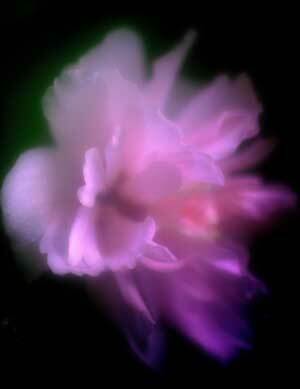 The trumpet shaped flowers are 2" — 4" across in colors of white, pink, red, violet or purple. They stay open for one day and close at night. Single-flowered varieties are hardier than the double-flowered types. The roots are located just below the soil surface. Rose of Sharon is tolerant of many soil textures, moisture conditions, and acid to alkaline pH if it is in full or nearly full sun. However, it requires ample moisture and some protection from midday to afternoon sun to flower at it's best. The shrub will keep its upright form as it grows, so little pruning is required. While shaping or pruning can be done at any time, pruning in late winter or early spring will minimize the loss of the emerging flower buds on the new growth. Pruning heavily in early spring or pruning back to 2 — 3 buds will produce fewer but larger flowers. It can be pruned to to create a single trunk small specimen tree. Transplanting should be done in the spring as the shrub takes some time to get established. Plant about 2' — 3' apart for a single row hedge. Seed collection is easy. 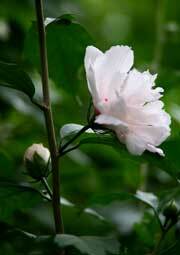 Allow the flowers to fade, do not shear back or prune the bush after flowering. Seed pods are somewhat tear-shaped, fat and nearly an inch across, immature pods remain a medium green. When mature they turn dusty brown and split apart. Remove the mature pods and allow to dry for a few days to ease with seed removal. Several dried pods can be placed in a tightly lidded plastic container to be shaken, the rattling will loosen and release the seeds from the pods. Remove empty pods and puff the chaff away to have clean seeds. The seeds themselves are reddish brown, flat discs, and a little more than a 1/4" across.